From left to right: Anne Smith, Phil Redmond, Andy Gillon and Ian Christie. Congratulations goes out to the IQ Scottish branch, winners of the IQ Presidents Branch Trophy for 2018. As the countdown to Hillhead 2018 draws closer, members of the Institute of Quarrying (IQ) are encouraged to introduce a friend or colleague to membership at the IQ stand (RB26) for the chance to walk away with an array of exclusive rewards. Visitors can plan who they want to meet to the minute at this year’s Hillhead with ‘Engage’, a smart new online planning tool sponsored by the Institute of Quarrying (IQ). 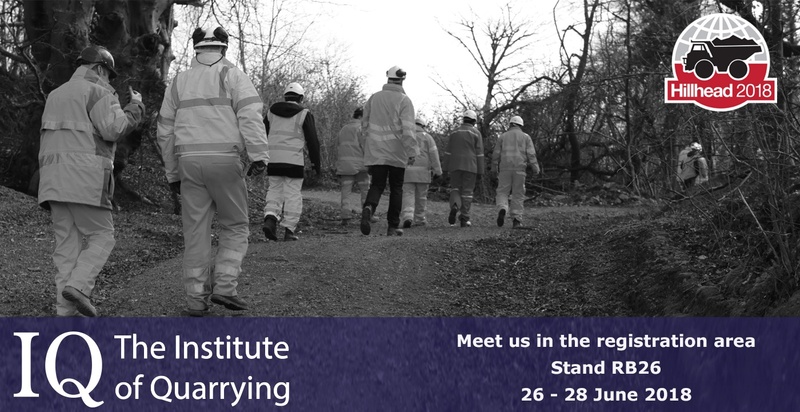 Members of the Institute of Quarrying (IQ) attending Hillhead are encouraged to say hello to the membership body at stand location RB26 and bring along a friend or colleague for the chance to walk away with an array of exclusive goodies. It’s official. Hillhead, the world’s biggest quarrying exhibition, has sold out. With more than 500 exhibitors, exciting product demonstrations and 18,500 visitors at the bigger and better event, IQ members will earn valuable continuing professional development (CPD) when they attend the show. The countdown to the biggest quarrying exhibition of its kind in the world has begun and the Institute of Quarrying (IQ) is proud to be supporting Hillhead 2018. The IQ Skills Wheel highlights those key areas of knowledge that all employees should aim to develop as part of their commitment to lifelong learning.